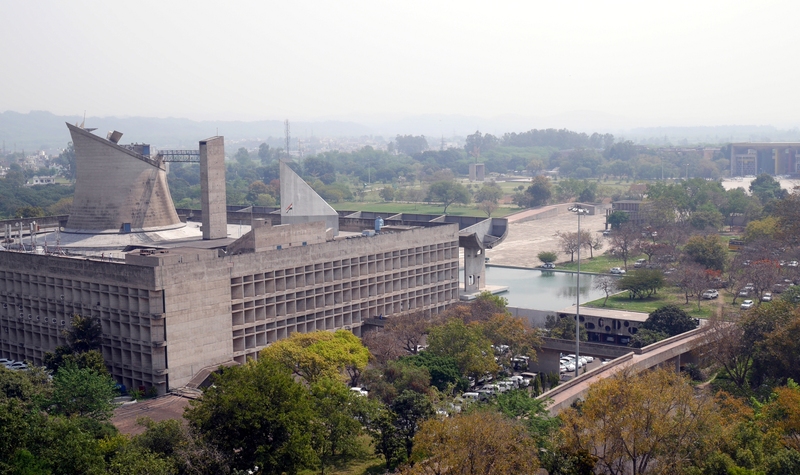 The Legislative Assembly in Chandigarh, designed by Le Corbusier. I remember the first time I heard about Chandigarh, the planned capital of the Indian states of Punjab and Haryana. It was during my first sojourn in India, after I had already spent several months exploring the country. It was a long and boring Saturday afternoon, and I was looking at the Rough Guide to India. I came across the city map of Chandigarh, which has perfectly rectangular, uniformly-sized blocks. I thought: Huh? I was used to seeing Indian cities that had been laid out haphazardly, so how did Chandigarh get to be built on a grid? As I learned later, Chandigarh was built after Partition to replace Lahore, the traditional capital of Punjab, which was now in Pakistan. (At this time, Punjab and Haryana were a single state.) Prime Minister Nehru was in favor of building a totally modern capital for Punjab, to represent India’s arrival on the world stage as a modern nation. The individual who gets most of the credit for designing Chandigarh was the Swiss-born architect and prophet of modernism Le Corbusier. In reality, Le Corbusier was not the sole creator of Chandigarh, as he modified a town plan worked out earlier by the American architect Albert Mayer. The first phase of Le Corbusier’s plan, which ended up getting built with some further modifications, called for twenty-nine numbered sectors separated by huge landscaped boulevards. The state government buildings are in the Capitol Complex in Sector 1, and the main commercial district is Sector 17. 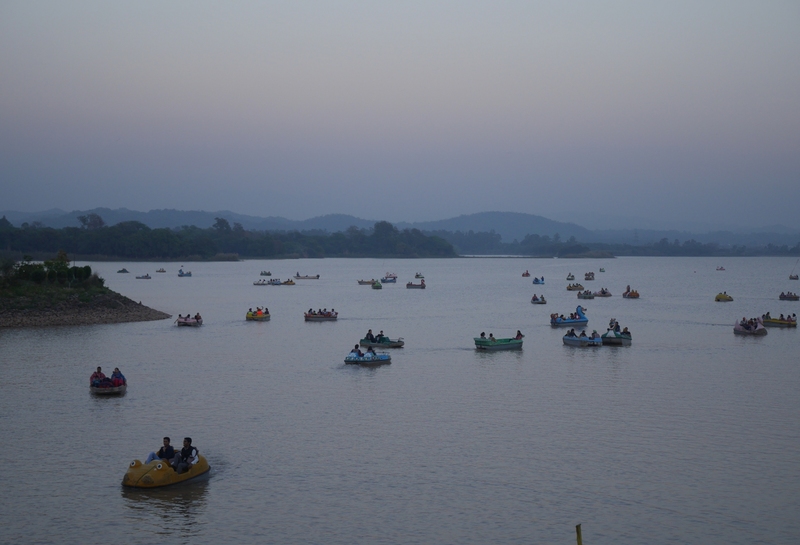 Northeast of the city, in Sector 6, is a large city park centered around Sukhna Lake, an artificial lake impounded by a long embankment. 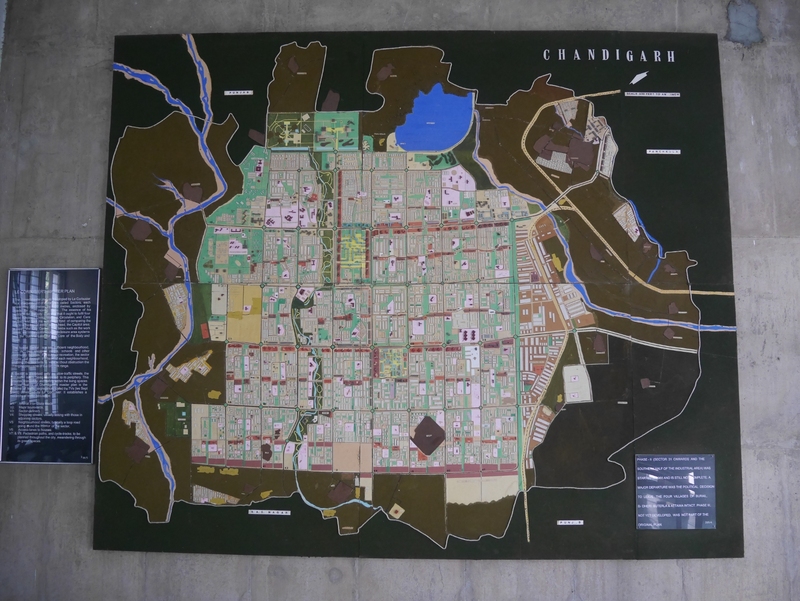 The town plan of Chandigarh, as portrayed in the city museum. 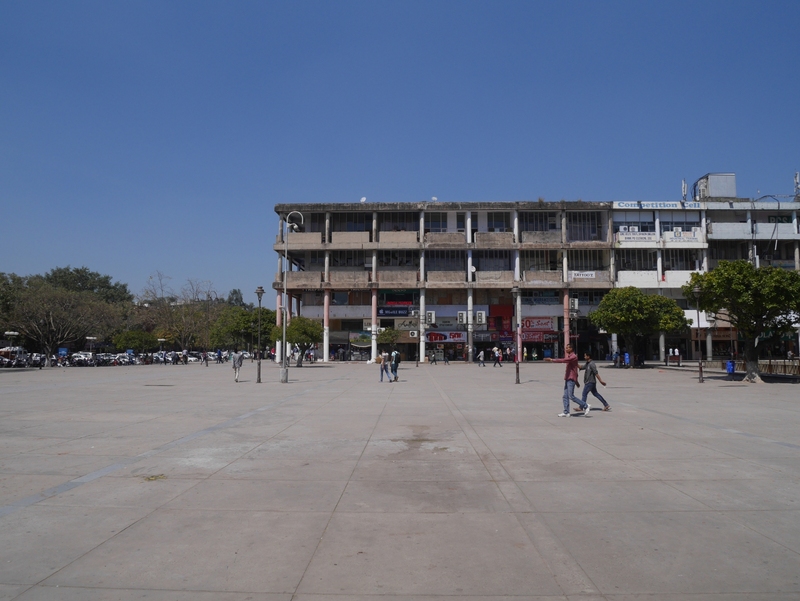 Chandigarh has gained a certain notoriety for its unusual town plan. The scale of the city makes it impossible to get anywhere by walking. The population density is too low to support a metro, and the city buses run infrequently. More than anywhere else in India, the people of Chandigarh have to rely on private automobiles to get around their city. In fact, Chandigarh is the only place in India that has more registered motor vehicles than people. (This includes scooters and motorbikes as well as cars.) 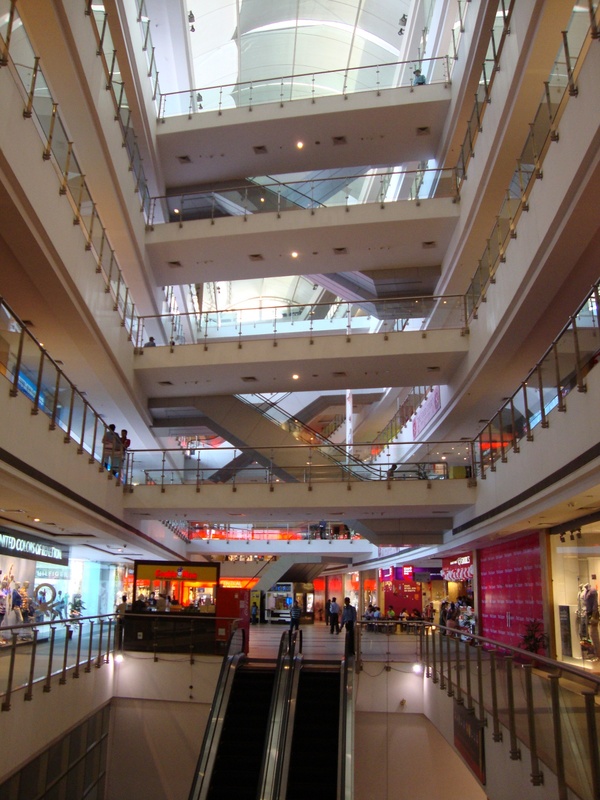 The shopping center at Sector 17 is so large and sparse that it is never crowded and bustling like the commercial districts of other Indian cities. James C. Scott devoted a couple of pages to Chandigarh in his seminal critique of authoritarian high-modernism, Seeing Like a State: How Certain Schemes to Improve the Human Condition Have Failed (1998). He included a black-and-white photo of Sector 17, which looks like a massive concrete wasteland with a few tiny human figures standing in it. My attempt at recreating the photograph of Sector 17 in Scott’s Seeing Like a State. Five years after first learning about Chandigarh, I have finally gotten a chance to visit the city. I could not draw any definitive conclusions about Chandigarh from a few short days there, but I did see enough to conclude that dire reports of the city’s poor planning and un-Indianness are exaggerated. While I do agree that it was foolish to make the city as big and spread-out as it is, it is still unmistakably an Indian city. Although private cars and motorbikes dominate the roads, there are also plenty of cycle rickshaws, autorickshaws, bicycles, and even horse carts. Sector 17 is a little bigger than it needs to be, but I feel that the austere photograph in Scott’s book misrepresents the place. It was likely taken early in the city’s life, before the place had had a chance to mature. In 2015, the shops around Sector 17 have brightly printed signs above them, like shops everywhere else in India. Far from being a concrete wasteland, the plaza in the middle of Sector 17 now has pipal trees and park benches in it. 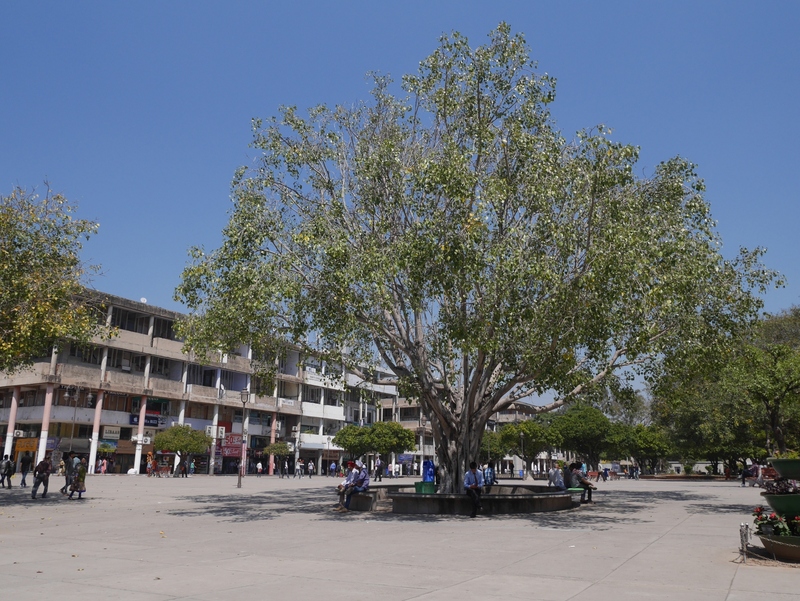 A pipal tree in Sector 17, Chandigarh. Chandigarh is certainly unusual, but it is not exceptional in India. 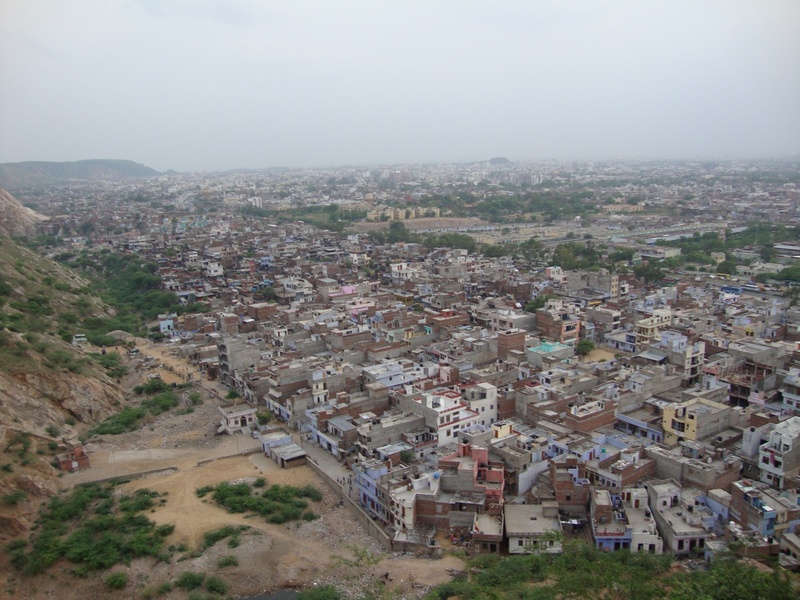 Planned towns in the Indian subcontinent date back to antiquity. Harappa and Mohenjo-Daro, two archaeological sites in present-day Pakistan, are the remains of two nearly identical cities built more than three thousand years ago. Although we know nothing about Harappan society, it is clear that they had a strong and centralized government that was able to enforce the town plan. Texts from later Indian antiquity describe the ideal city as a large square subdivided into square blocks, with the king’s palace in the central block. It is not clear whether such a city was actually constructed in antiquity, although the builders of Jaipur did follow the ancient guidelines when they laid out their city in the early eighteenth century. The arrival of British colonists brought European-style town planning to India. Some Indian towns still have cantonment areas laid out in perfect grids for the British who once occupied them. 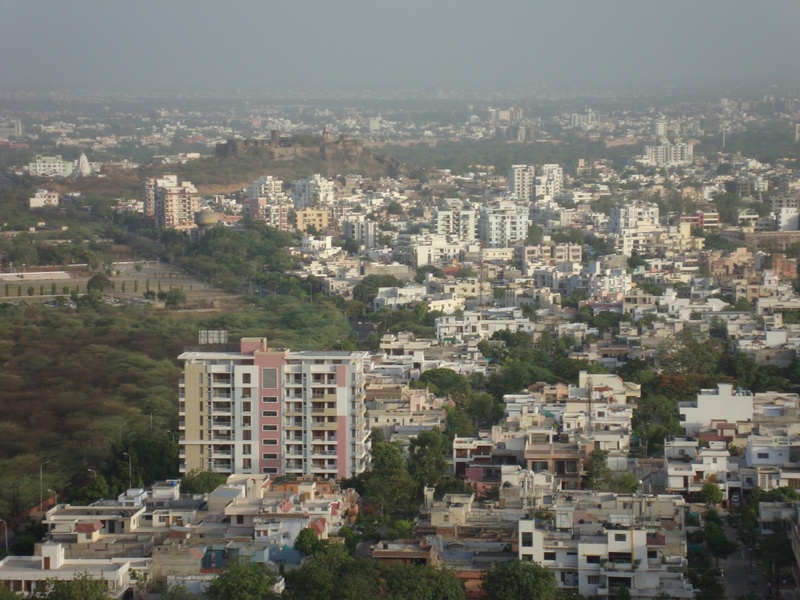 Since independence, extensions of many existing Indian cities have been built on lines similar to Chandigarh. 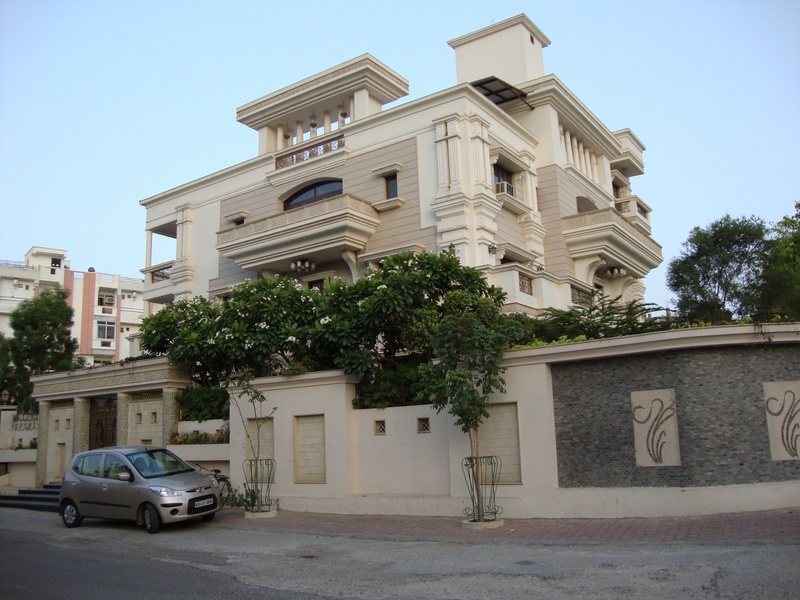 For example, Dwarka Sub-City in Delhi National Capital Territory was laid out by the Delhi Development Authority. (Other cities have similar agencies overseeing their expansions.) Dwarka is not built on a perfect grid, but it is built sector-by-sector with large streets separating the sectors. It does not seem to be a very efficient use of space. The Delhi Metro runs through Dwarka, but much of the sub-city is not convenient to the metro. The housing societies are built for people who own their own cars. Apart from the scale, the most significant difference between Chandigarh and Dwarka is the underlying motive for construction. From start to finish, Chandigarh is infused with modernist ideology; it declares that India has arrived as a modern nation. Dwarka, on the other hand, is just a place for middle-class people to live. 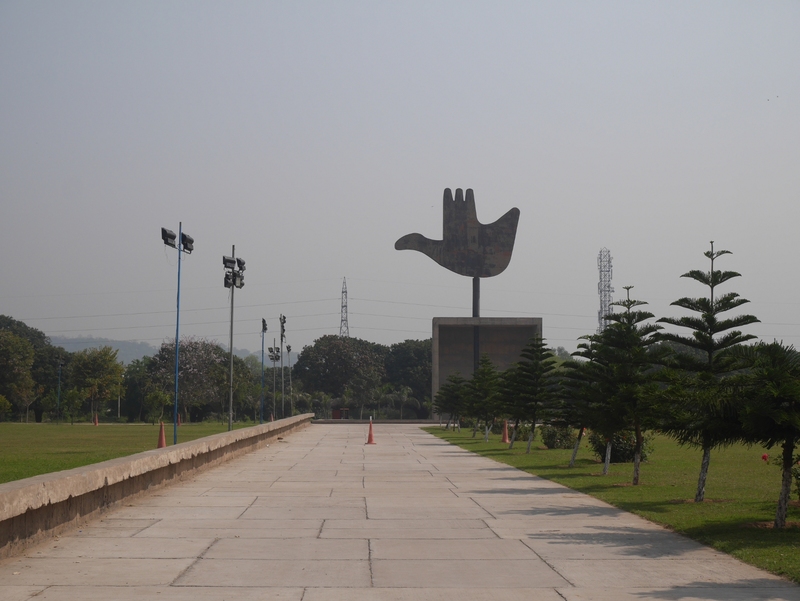 Chandigarh’s Open Hand Monument, designed by Le Corbusier but not constructed until 1985. While studying up on the Knights Templar for a recent class presentation, I came across a book called The Jerusalem Temple, by Simon Goldhill.1 This interesting little book (small format, less than 200 pages) tracks the idea of the Temple from it construction through its destruction and continued reimagining by Jews, Christians, and Muslims alike. The book explains how the idea of the Temple has been interpreted and reinterpreted throughout the ages by people of different faiths. Some background is in order here. The term “Jerusalem temple” refers to three different buildings that were constructed atop a hill known as Mount Zion. The first temple was built around 1000 BC by Solomon, the third king of Israel. The Babylonian army under Nebuchadnezzar destroyed the temple in 587 BC, when they carried the Jews off into their first exile. Following the overthrow of the Babylonian Empire by the Persians in 539 BC, some Jews returned to Jerusalem and built a lower-budget second temple. This rebuilt temple stood until 19 BC, when Herod the Great replaced it with a much larger and more opulent structure. In addition to an enlarged central sanctuary, Herod’s building project involved the expansion of a natural hill into a massive elevated platform, the Temple Mount. The sanctuary of Herod’s Temple did not even last a century; the Roman army destroyed it during the siege of Jerusalem in AD 70. The Temple Mount survived, in part. Later it served as the foundation for two Islamic structures, both built in the seventh century: the Dome of the Rock, in the center of the Mount, and al-Aqsa Mosque, on its southern edge. These two structures continue to stand on the Temple Mount to this day. A particularly interesting part of Goldhill’s book is his discussion of reconstructions of the Temple. For reasons ranging from fervent piety to detached scholarly interest, countless individuals over the ages have attempted to reconstruct Solomon’s or Herod’s Temples. (Although it stood longer than any of the other temples, the lower-budget second temple has not captured the imagination of reconstructors in the same way as its predecessor and successor have.) Reconstructions made by Christians in the Middle Ages showed temples built in Gothic style. During the Renaissance, reconstructed Temples looked like Italian palaces. Although literary descriptions of the temples describe them as rectangular buildings, some artists used the round shape of the extant Dome of the Rock to represent the Temple. It was only in the late nineteenth and early twentieth centuries that reconstructors started to pay attention to archeological evidence in the interest of making their reconstructions more authentic. Goldhill’s descriptions of reconstructions interested me, in part, because I am one of the countless people throughout the ages who has attempted to reconstruct the Jerusalem Temple. 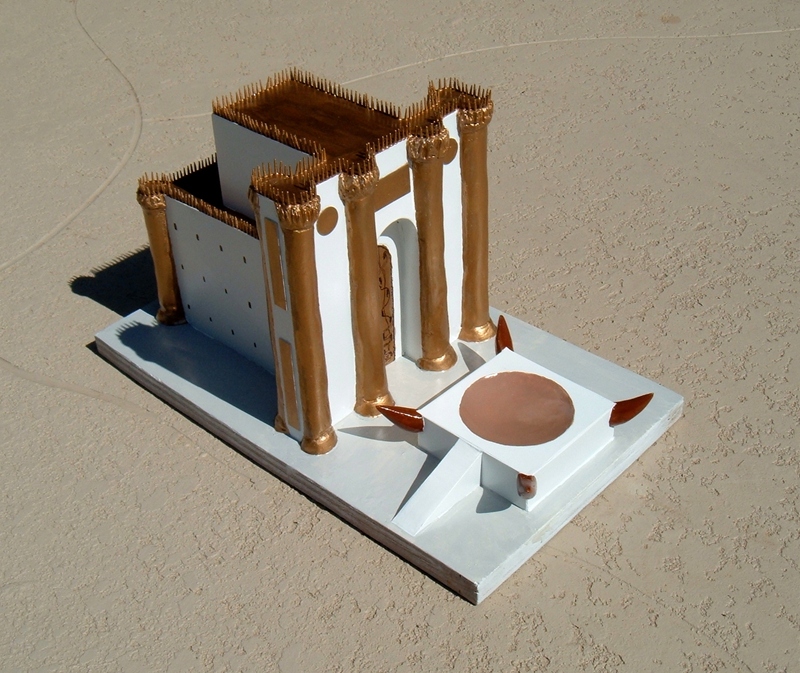 In 2003, when I was in high school, I set to work reconstructing both Solomon’s and Herod’s Temples. My model of Solomon’s Temple was a simple affair of polystyrene foam based on the descriptions in I Kings. By contrast, my model of Herod’s Temple was much more ambitious. I drew up the plans for it based on the description found in Flavius Josephus’s The Jewish War (only one of several sources I could have used). Over the next four years, off and on, I worked on my model, until I finally finished it in 2007. My model of Herod’s Temple, built in 1/250 scale. 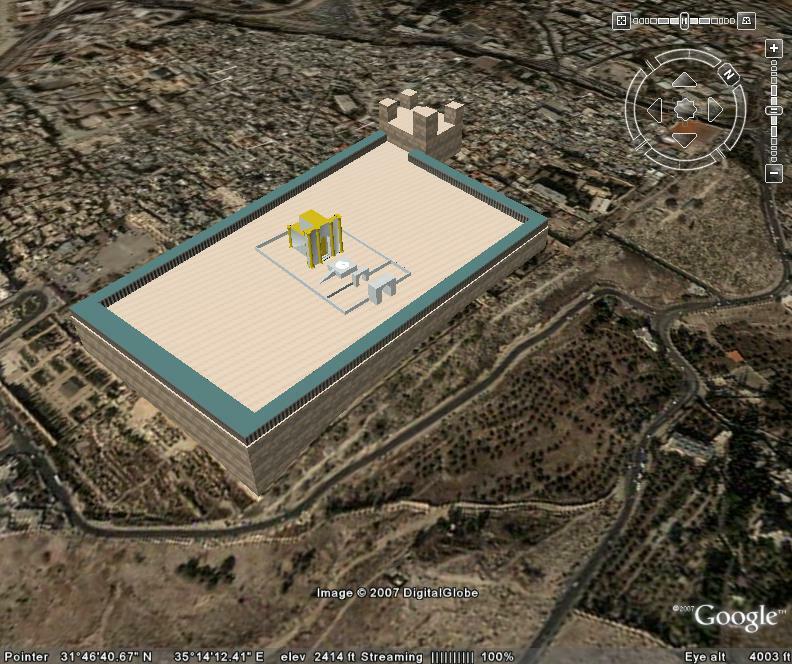 One of my digital Herod’s Temples, placed in Google Earth. The view is from the southeast. Reading Goldhill’s book has made me want to make another reconstruction of Herod’s Temple, based on literary sources besides Josephus, as well as all of the latest archeological scholarship. I probably won’t be able to do that when I’m still in grad school, though. Goldhill argues that all reconstructions belong to their times, and they tell us as much about the time they belong to as they do of the period they attempt to represent. This is obvious in the case of the medieval and Renaissance reconstructions that used the currently fashionable architectural styles to represent buildings that were supposed to have been built thousands of years ago. But it is also the case with the more recent reconstructions—including my own. They tell us that they belong to a time that values rational analysis and trusts the work of scholars such as archeologists. They also tell us that interest in the Jerusalem temples still has not faded, more than 1900 years after the last one was destroyed. The western media portray two starkly contrasting views of India. On the one hand is the India of startling economic success, of call centers and Mumbai highrises—a high-tech country that has developed its own nuclear arsenal and sent a probe to the moon. Since the liberalization of the Indian economy in 1991, foreign economic investment has poured into India, and foreign brands and services have appeared in the country: MTV, Subway, Pizza Hut—and as of 2012, Starbucks. It is an India of private cars, smartphones, Facebook, and Twitter. In many ways, the lives led by the residents of this India would not be unfamiliar to a resident of North America or western Europe. The other image of India is almost completely different from the first. This is the India or grinding urban poverty, as memorably (if sentimentally) portrayed in the popular and critically-acclaimed British film Slumdog Millionaire. 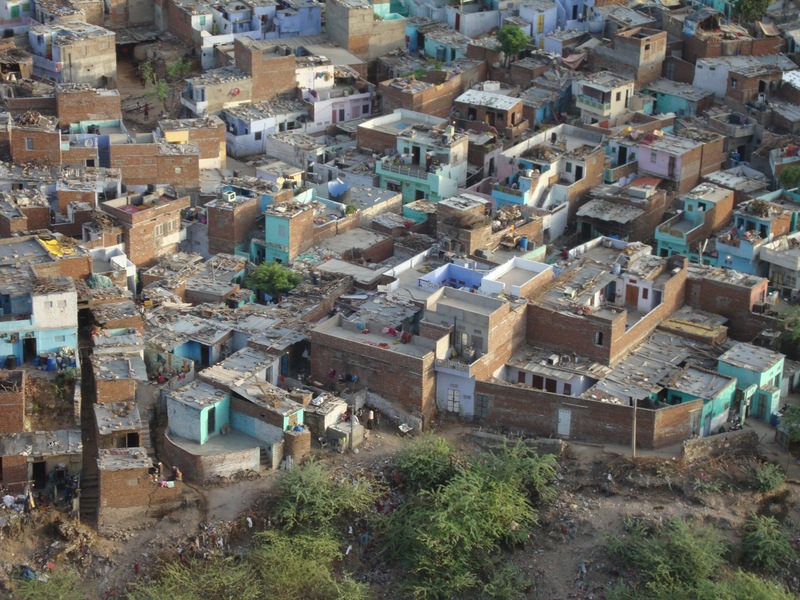 The residents of this India live in squalid slums, where sanitation is poor and health care is nonexistent. Not surprisingly, they do not patronize Pizza Hut and have no way of watching MTV. The dual economy was impossible to ignore when I spent a summer in Jaipur, the capital of Rajasthan. 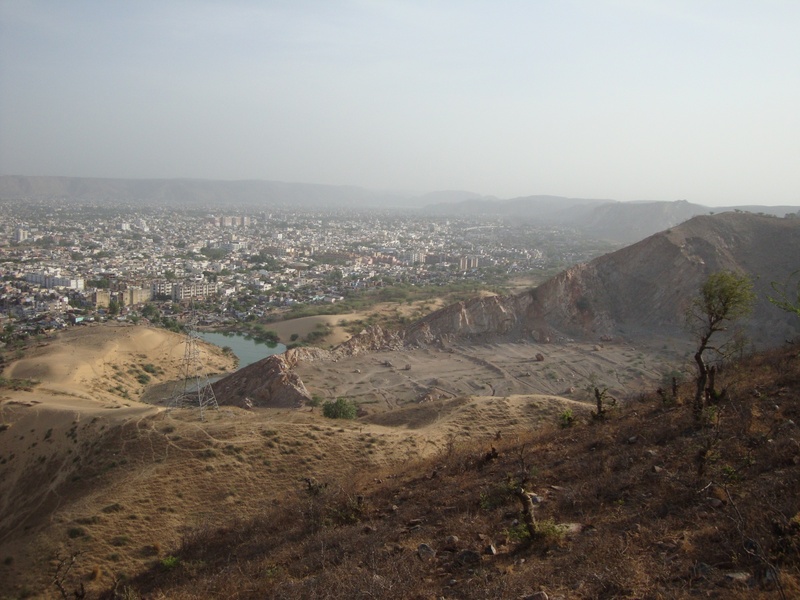 Jaipur is far from India’s largest or most prosperous city; it is India’s eleventh-largest, by population. But the contrast between the two economies was shocking, even in Jaipur. The following pictures illustrate some of the contrasts of the dual economy. Reports of India’s economic success are greatly exaggerated. Trickle-down economics have simply not worked in India. No economic growth can be considered genuinely successful if it bypasses the majority of a country’s population.